In earlier times it was customary that a bishop would be chosen for his ministry by his own flock, by the people of the Church themselves, and only thereafter would his consecration – that is, his ordination – take place in church. Once in ancient Italy, in the city of Milan – which was then called Mediolanum ­– the head of the local Church died and elections for a new bishop began. As with all elections, this was a tumultuous assembly. For several days there were disputes, with first one person being put forward and then another. Opinions were divided among people and clashes even broke out between disputants. Then, in order to maintain peace in the sizeable crowd, the local prefect or chief of police was called in. He was a just and kind man, well known in the city, who had not yet been baptized. 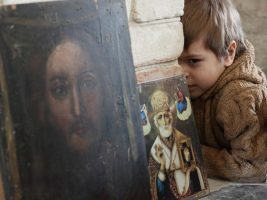 As was then the custom, he belonged to the catechumenate – that is, he was preparing for baptism – although he was already in his fourth decade of life. This chief of police, whose name was Ambrose, came to church to restore order during the tumultuous and noisy disputes about the election of the bishop. Then suddenly, during the discussion of the candidates, someone cried out (perhaps it was a wag or a child): “Ambrose will be bishop!” The crowd went silent for a moment, and then everyone cried out; both the clergy and the people turned to this Ambrose. The entire Church of Mediolanum unanimously decided that this very person, who did not have a theological education and was not yet baptized, should be their bishop. 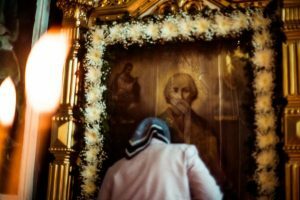 He himself, of course, was very confused and bewildered: he had never prepared for ecclesiastical duties and had long put off his own baptism, but he took this as God’s calling and obeyed the people’s will. As if through the mouth of that child or anonymous person who had cried out his name, the Lord called him: “Ambrose, follow Me!” He accepted unwaveringly and within a few days was baptized and then, a few days after that, was entrusted with his omophorion from the bishops, becoming the Bishop of Milan or Mediolanum. 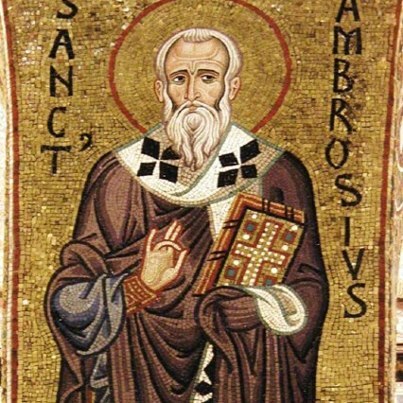 Many, many centuries have since passed, and the Church holds sacred the memory of Ambrose of Milan. Today we are celebrating his feast day, inasmuch as he was numbered among the ranks of the saints. 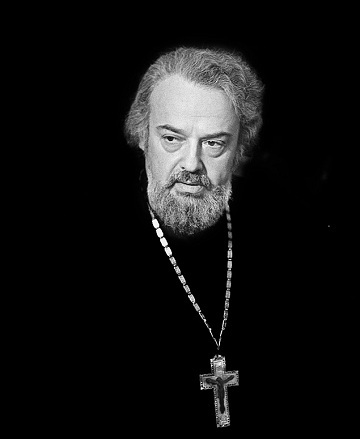 He was a great man of the Church: he was an organizer, a steward, and a remarkable poet who composed church hymns. According to tradition, the famous hymn we sing during the moleben, “We praise Thee, O God,” was composed by Ambrose of Milan. He also wrote commentaries on the Holy Scriptures for us. It was then the practice to baptize everyone on Pascha, for which people prepared throughout Great Lent. Each day Ambrose sat in church, where those preparing for baptism gathered, and read the Bible to them from beginning to end, explaining the meaning of the word of God. Scribes recorded his talks, and these formed the many books of St. Ambrose of Milan. If you are visited by illness or grief, this is God’s call to patience. If the person next to you is experiencing difficulties, this is also God’s call. If you make the choice whether to act basely or nobly, this is also clearly God’s call. If you wake up in the morning, as if risen from the deathly sleep of night, then God is calling you to labor this morning. Today we heard the Gospel reading about the healing of the leper. Leprosy was a terrible disease, which we only recently learned how to treat. Even one hundred years ago it was untreatable. There were islands to which the sick were taken and cast to the mercy of fate. They lived there, rotting alive, losing their fingers and ears. Frightful to behold and abandoned, devastated both spiritually and morally, they lived in huts like animals. Ships on which missionaries were travelling to preach the word of God to savages and heathens sometimes passed by these islands. On one of these ships was a very young priest from Belgium, Damien de Veuster, who was not much more than twenty years old. He had also gone to preach the Gospel to the pagans, but when he learned that there was an island nearby where people lived as though in hell, he could not go any further. He felt that God’s voice was calling him. He left his ship and stayed on that island forever. And he, as they say, raised these people from the dead: he got them to build houses, he built them a church, and he raised their spirits. They began to live like human beings. This island was transformed, its life becoming completely different, although he himself caught leprosy and died. But he had done his duty! Thus, God’s voice calls us in the most unexpected moments. We might think about and await one thing, but find another. We might begin building our plans in one way, but if the Lord calls us, then let His will be accomplished! Do not forget those words from the “Our Father” – few in words but great in meaning – that to us are immortal and precious: “Thy will be done!” Amen.